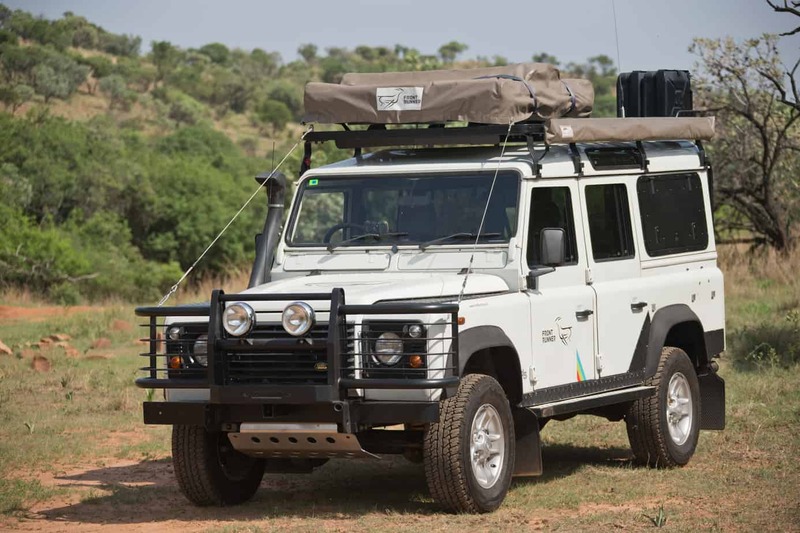 A Land Rover Defender in Africa captures all of the heritage and spirit of overland travel, a vehicle steeped in history and exploration of this stunning and wild continent. During my last trip to South Africa, I had the opportunity to spend a few days with this classic overlander, thoughtfully prepared by the experienced team at Front Runner, taking this 2003 Td5 110 into the mountains north of Pretoria and into a few game reserves and 4wd tracks. Despite the age of the platform, jumping into a 110 immediately feels like an adventure, the eager turbo diesel propelling (well, maybe meandering) me towards the wild kingdom. Even the rattles and clatter feels right as I rolled down the windows to bring in the cool air of a Jo’burg morning, and to allow some room for my right arm, the seat oddly shoved against the door, the steering wheel off-center. But even that ergonomic oddity also feels, as it should. Arriving at De Wildt, a game park and 4wd playground, I clunked the transfer case into low and locked the center differential. The suspension on this 110 is mostly stock, save for some uprated rear springs and Old Man Emu shocks. The ride was good, in typical Land Rover fashion, managing the weight of the accessories and loaded roof rack with hardly a complaint. Defenders are always at their best in low range, the small-displacement turbo diesels complimenting the 3.31 transfer case gearing and engine torque. 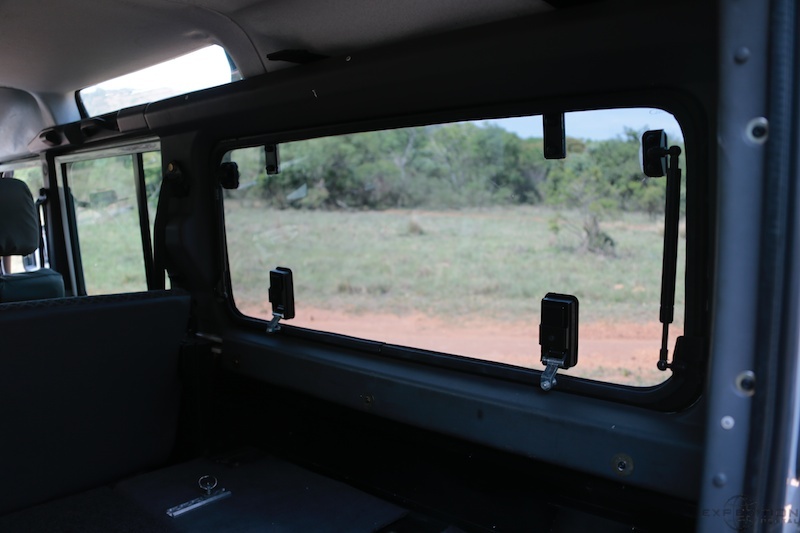 Nothing happens quickly, but the Defender moved through each obstacle without issue, the suspension doing work that would require differential locks on a Land Cruiser or G-Wagon. The first obstacle was a loose descent and then climb, deep cross-axle holes showing evidence of the wheel spin from vehicles that came before. Again, the Defender flexed and stayed composed- I was certain that the tame all-terrains would lose traction, but the weight shifted rearward and the 110 climbed. 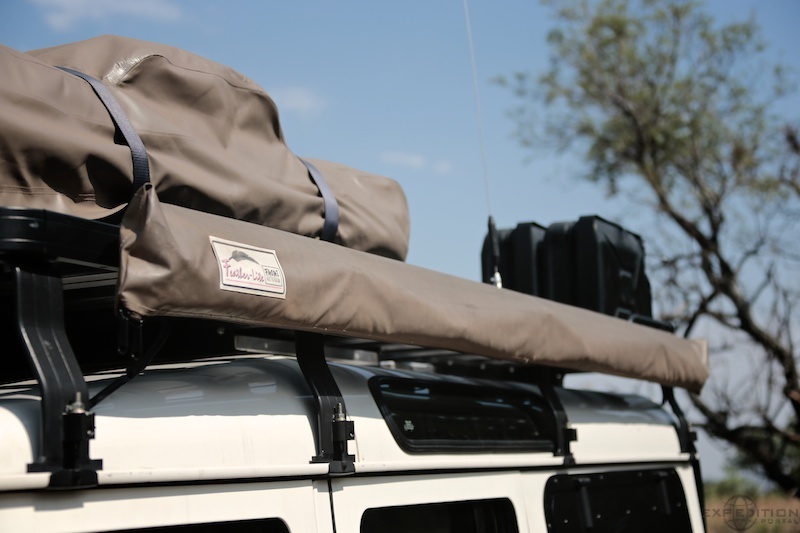 This particular Defender is consistent with many South African safari vehicles, attention given primarily to long trips and camping in the field. 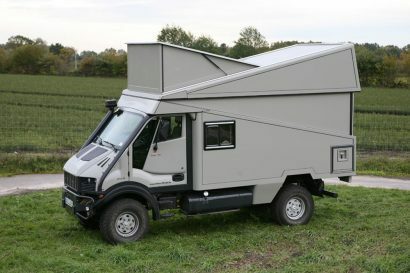 Trail modifications are less important, and payload is allocated to storage and sleeping solutions. 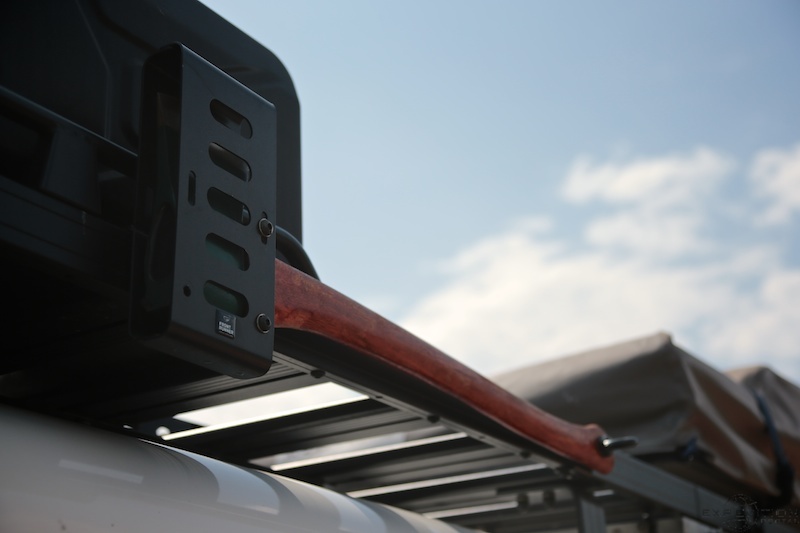 For storage, it starts with a Front Runner rear drawer unit, designed specifically for the Defender and low profile. 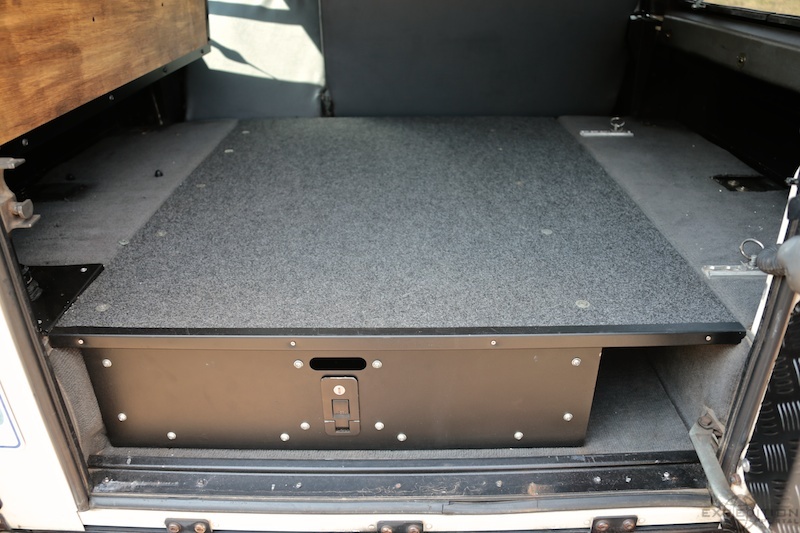 I prefer the low drawer, as it allows for configuring the vehicle for everything from dog crates to Pelican cases or Wolf boxes. The drawer also has a long, open area to the right, making the perfect spot for chairs or tool rolls. This 110 was also fitted with the unique rear window storage compartment, a metal door concealing a series of shelves, all lined and divided by wood. 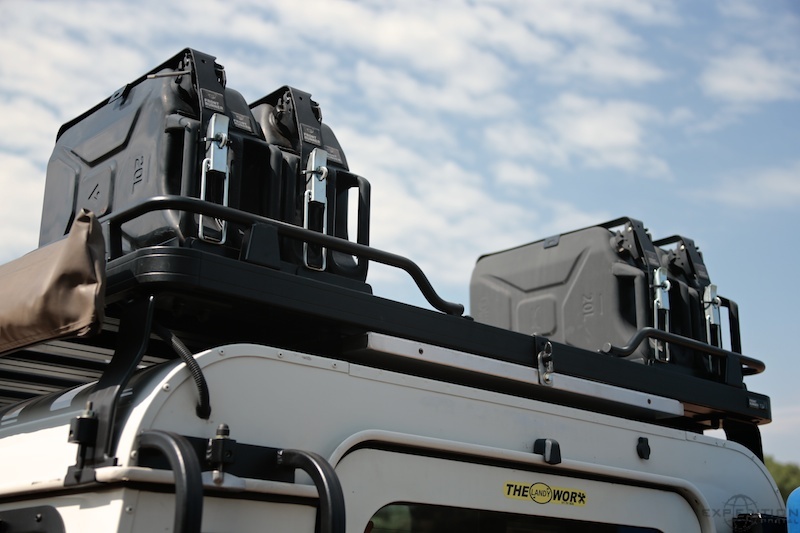 These compartments are perfect for quick grab and frequently accessed items like recovery equipment, tripods, etc. The metal door is thick and lockable, increasing security. The driver’s side had a similar unit, but with a glass door. I found the glass door a bit concerning, as it is such a unique piece, and would be hard to replace on a trip, should it be broken. 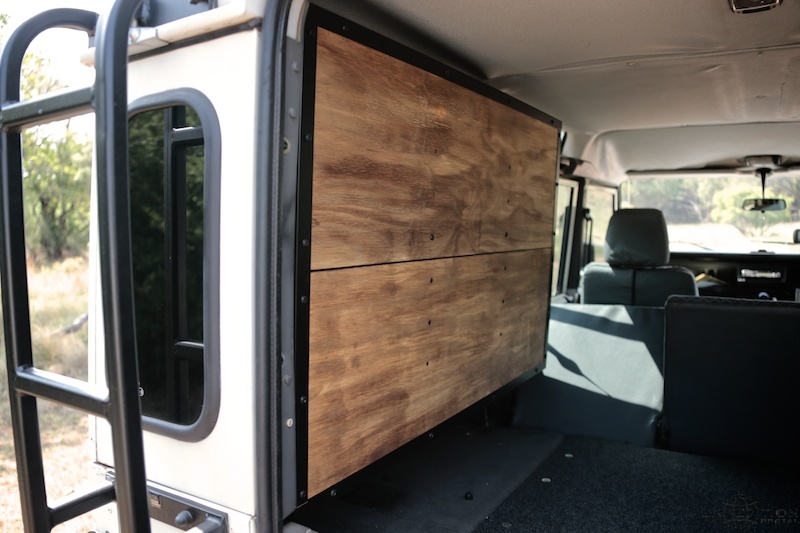 The steel door is perfect, and what I would want on both sides, giving the 110 more of a van body and better security, all while improving access. The rear also included the Front Runner Defender water tank, which utilizes empty space in the quarter panel, and plumbs the spigot to the rear bumper. I have used this water tank on other Defenders, and it is brilliant use of space. Mounted to the rear bumper was a HiLift jack and the rear ladder. There was also a mount for the propane bottle. Completing the rear is a HD tire swing-out and lens protectors for the stop and indicator lights. Front Runner makes one of my favorite racks, and much attention was paid to equipment and accessories above the roof line. 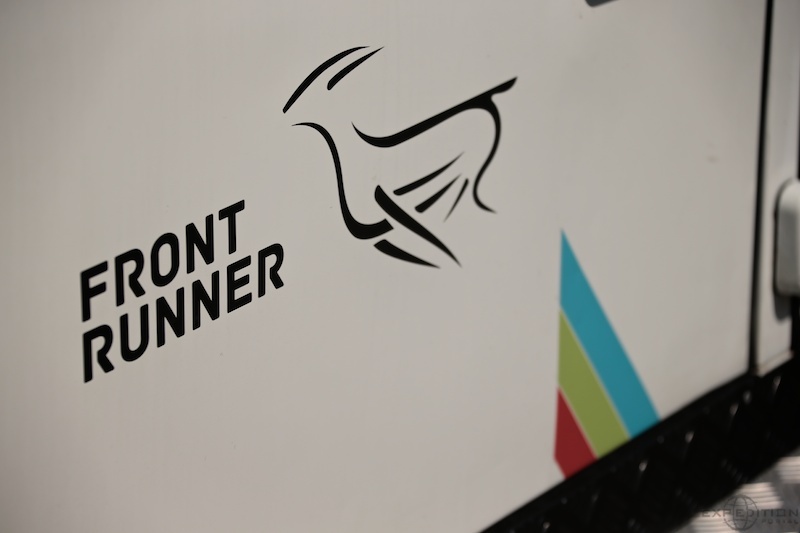 What I like about the Front Runner rack is the lightweight and low-profile design. Their new racks are also modular, allowing easy replacement of individual panels (should they be damaged on the trail), or configuration to various needs. 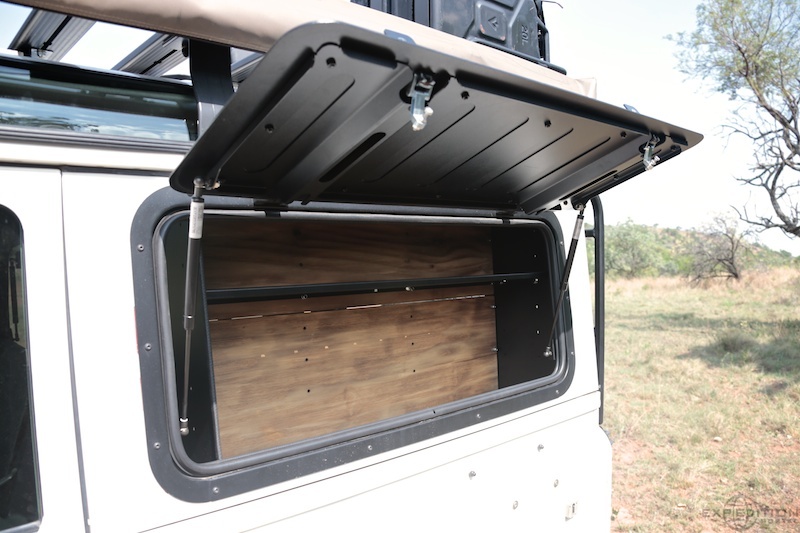 More cross slats can be added to make a photo deck, or fewer if the goal is weight savings or mounting just a roof tent. 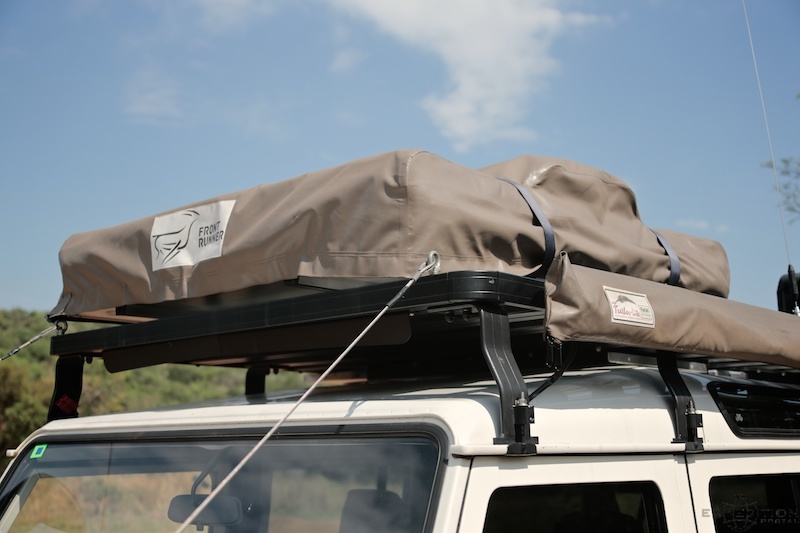 This particular rack was festooned with accessories, including a rearward top rail, NATO can holders, axe, awning, two tables and a roof tent. With the cans full, this load would be more than recommended, but being a test vehicle, this did allow review and use of all the accessories. Pick the ones you need, but I try to keep the roof loads around 150-175 lbs. or less—typically much less. 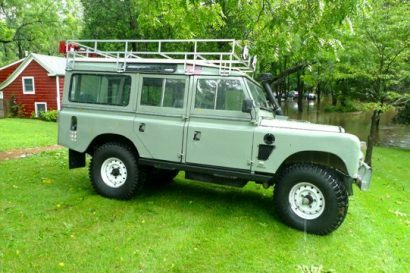 This Defender also included many trail accessories, most intended to protect the soft aluminum body panels and vulnerable underpinnings. From the front, a Front Runner bull bar was installed, and a pair of auxiliary lights mounted. 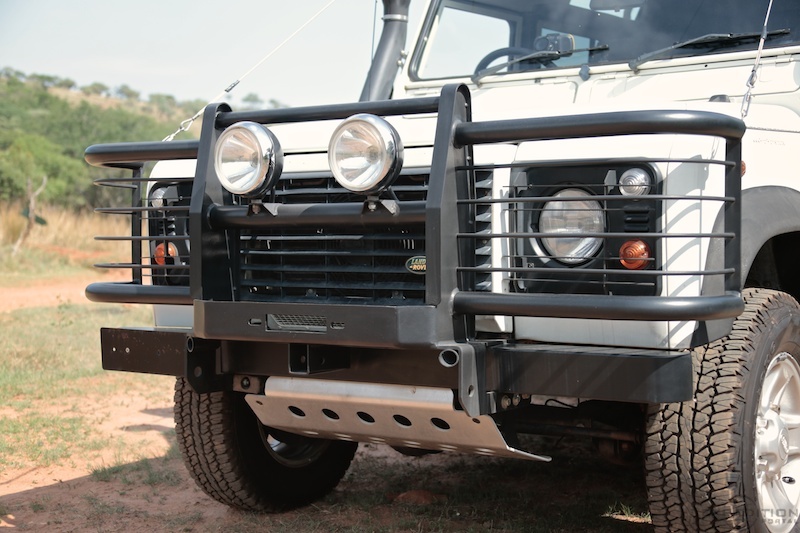 The bumper is huge, but styled in the typical fashion for southern Africa game vehicles, protecting the wings and bonnet from branches and errant Springbok. 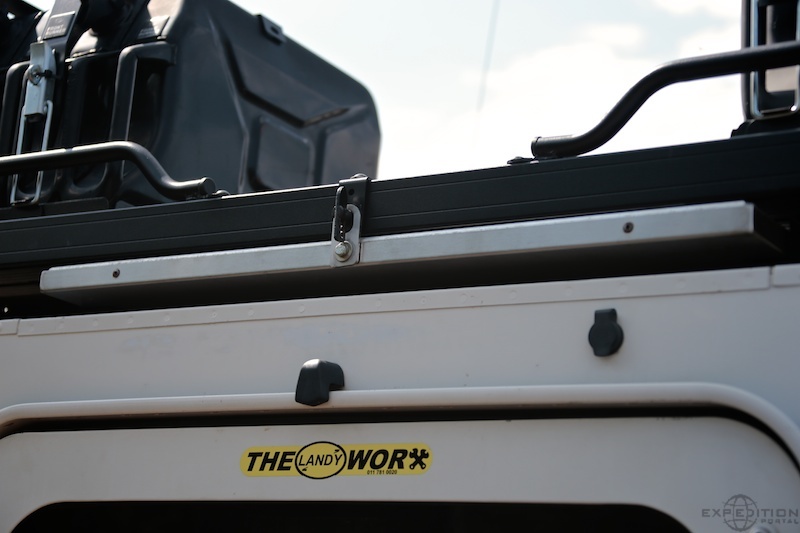 The unit includes a cradle for a winch and a 2” receiver. 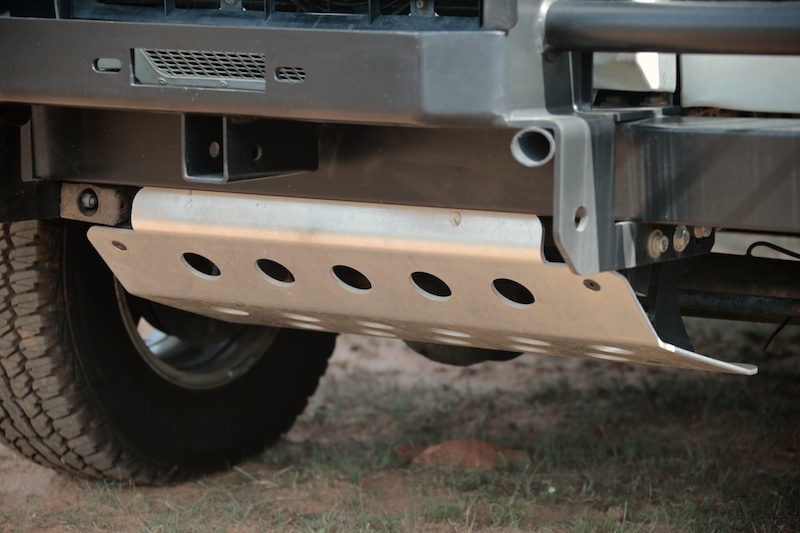 Below the bumper is a Front Runner aluminum bash plate, protecting the lower radiator and tie rod. 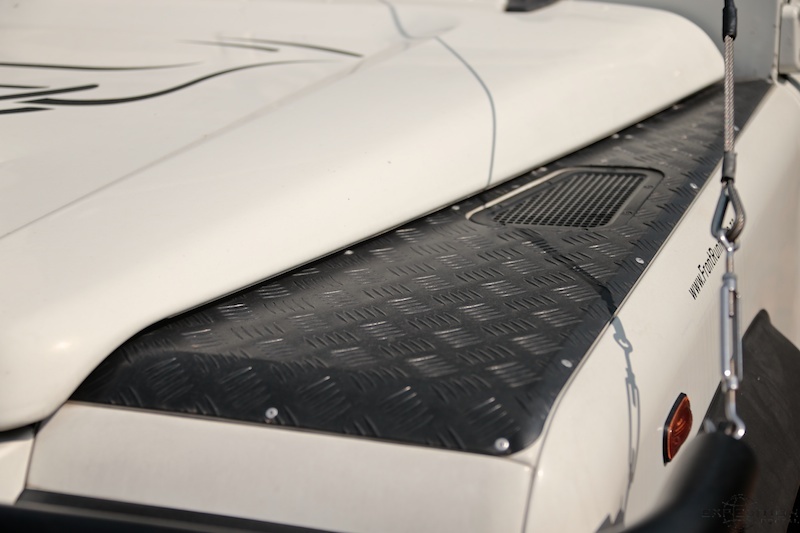 Fitted to the wings is black powder coated tread plate panels, also installed on the quarter panels. These mostly stop bumps and scrapes. 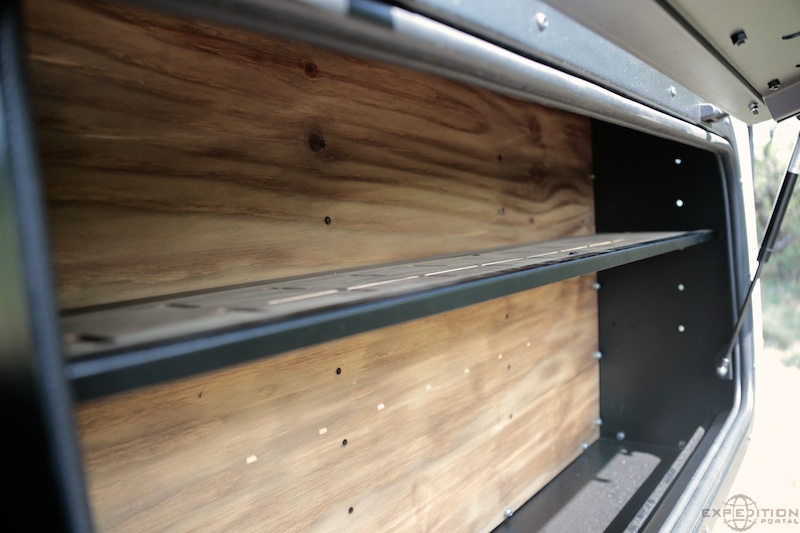 To take the bigger hits, square steel rock sliders were installed, proving a usable step for rack access as well. An Airtec snorkel completes the trail package. My few trips with the Defender were a great reminder of why I love that vehicle, but more important why I love Southern Africa. Just the fact that I could walk into a Land Rover dealership and buy a brand new 2013 Defender 130 (or HZJ76 TLC, or diesel G-Wagon) makes this a very, very special place. Exploring the bush is a long South African tradition, which supports innovation and quality products from companies like Front Runner. On my way back from Jo’burg, I rolled the windows down and cruised along the backroads with a big grin, the smell of the African wilds still filling the cabin and the temptation of turning around and doing it all over again.